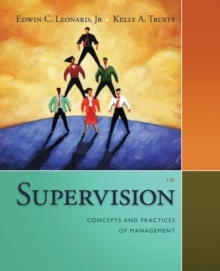 Differentiate yourself in a competitive marketplace with SUPERVISION: CONCEPTS AND PRACTICES OF MANAGEMENT, 13E. A blend of traditional management concepts and emerging insights, the text draws from the authors' firsthand business experience to deliver the leadership skills hiring managers want but rarely find in new recruits. This comprehensive single source for supervisory management expertise addresses the most critical challenges in business today, including globalization, economic turbulence, transitional and temporary workers, virtual employees, technology, outsourcing, and downsizing. Hands-on and practical, the text complements chapter readings with skill-building techniques and captivating video cases from well-known organizations, letting you experience supervisory roles yourself. Special attention to diversity and ethics also helps you develop a better sense of life beyond the classroom and enhances the text's extensive coverage of communication, decision making, conflict resolution, and other essential supervisory skills.